Just in time for Cinco de Mayo, I decided to share with you one of my favorite salmon taco recipes. For these tacos, made with soft flour tortillas, I rely on quickly cooked salmon fillets seasoned with avocado salsa and topped with a spicy-smooth chipotle sour cream; you can whip it up in an instant. Canned chipotle peppers are great to have in the pantry. They add vibrancy to so many dishes, and once you develop a taste for the fiery chilies, you will be hooked. The best part is, you can enjoy these on Cinco de Mayo or celebrate any taco Tuesday. 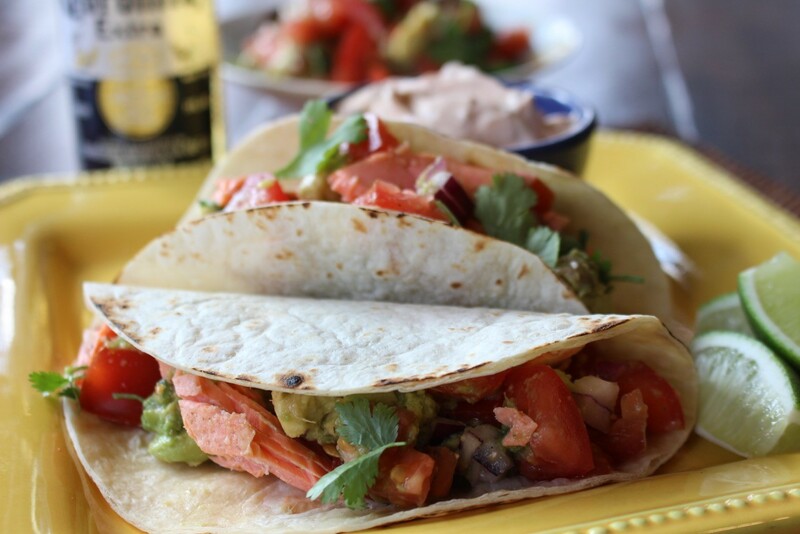 You’ll want to save this salmon taco recipe in your repertoire to impress family and friends. Cut each avocado in half lengthwise and remove the pit. Carefully scoop the flesh from the shell and dice it. Toss the diced avocado with the tomato, onion, cilantro, and lemon juice. Stir to mix and season to taste with salt and pepper. Season the salmon fillets with salt and pepper. In a medium sauté pan, heat the oil until smoking over medium-high heat and cook the salmon, fleshy sides down, for 4 to 5 minutes on each side or until cooked through. Transfer the fillets to a platter to cool slightly. Spoon heaping tablespoons of the avocado salsa onto each flour tortilla. Gently flake each salmon fillet with your fingers or a fork. Top the tortillas with salmon, Chipotle Sour Cream, and cilantro leaves. Stir together the sour cream, chipotle pepper, and adobo sauce and mix well. Serve right away or refrigerate, if not using soon. 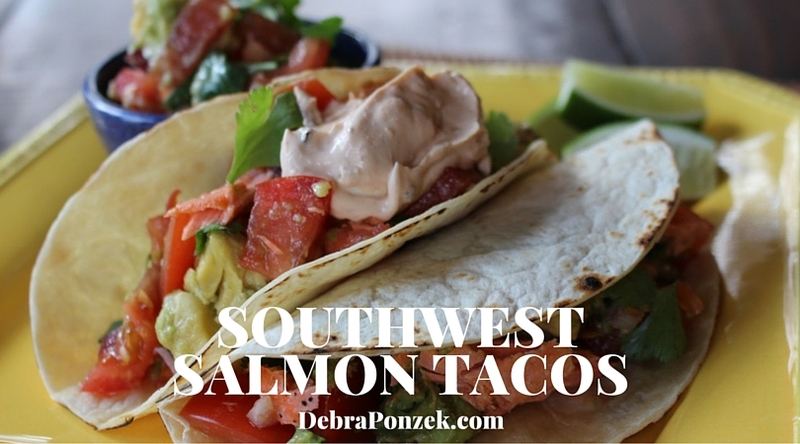 Southwestern Salmon tacos make a great lunch or dinner any time of year. They’re also a healthier choice since they have salmon instead of other, greasy meats. When making this recipe, don’t let the canned ingredients scare you off, it’s still a very fresh nd tasty dish you and your friends can enjoy together paired with a margarita. 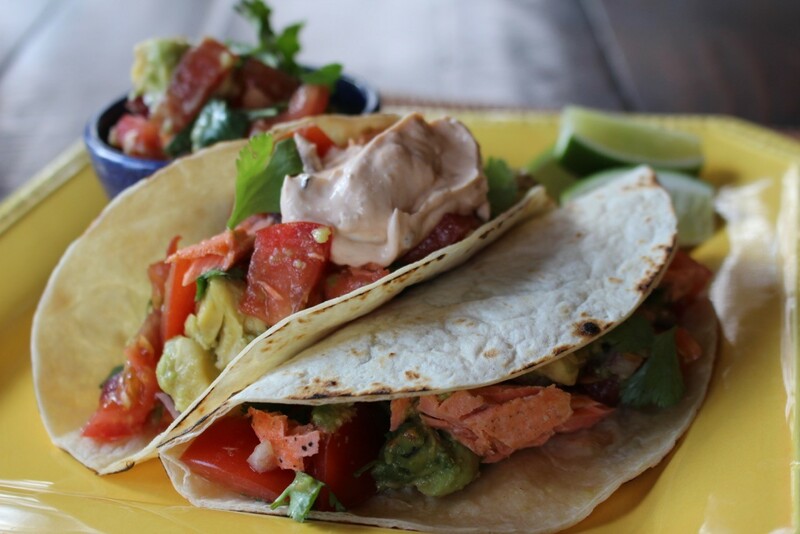 Just be careful, with this recipe, you’ll want to have salmon tacos every day.